the surface of the ocean will be covered in green living things so long as it receives sufficient fresh water. White tern checking out the progress of science in the mixed coconut forest of Nikumaroro. Like so many other things in the oceans, islands are bridges between the freshwater realm of the atmosphere and the salt water below. When precipitation falls on islands it gets trapped within the rocks and sediments that make up the islands and retains for a little while its fresh atmospheric character. Without the island to trap and store this fresh water the profusion of green life would not be possible, and indeed where the islands become too small or the rainfall too infrequent, plant life gradually disappears. Over time which plants stay and which go depends on how tolerant they are to drought and how good they are at extracting fresh water from the salt. With temperature increases, sea level rise and increasingly prolonged periods of drought predicted with climate change, the plant communities and the fragile fresh water lenses that sustains them are headed into an uncertain future throughout many of the Pacific low island nations. This trip for me has been a chance to try and better understand this complex and interesting interplay between plants, water, islands and the sea. In addition to being a scientist for SEA I am also working on a PhD at the University of Idaho and on this trip I've been fortunate enough to have the opportunity to collect physical and geophysical samples from the unique and beautiful islands within the Phoenix Islands Protected Area. These islands are in some ways an ideal laboratory for studying the climate and plant communities because they fall along a precipitation gradient, with the islands in the north receiving less rain than islands in the south. 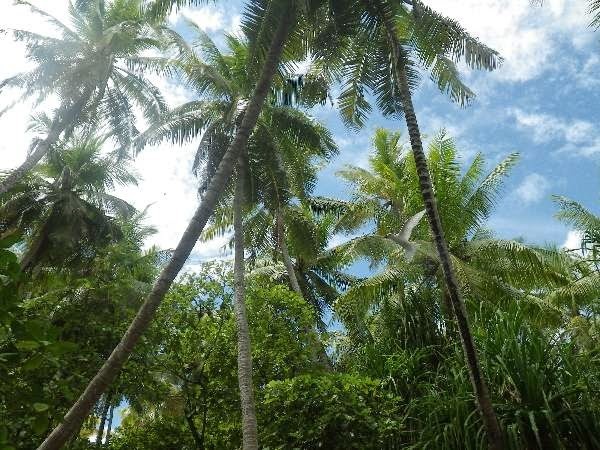 The vegetative communities are very different, though all of the islands where we sampled have introduced coconut trees. Known as the "tree of life" by many Polynesian people, the coconut is central to the livelihood and survival of millions of humans around the globe. Part of their appeal is that coconuts can survive under a wide range of environmental conditions, including in high salinity environments and during prolonged drought periods. Given their close association with humans, how well these trees do under variable environmental conditions may be an indicator of the suitability of each island community for supporting human populations. My ultimate goals with this research are to better understand how plant communities impact the availability of freshwater on these islands and to say something about what plant communities and freshwater availability in these regions might look like as the climate continues to change. For now, getting some actual time on the islands is enough to get me excited. 2nd scientist signing off from the green green harbor of Pago Pago.